The Strawberry patch is closed until 2019! If you missed the season please make sure you join our email list so you receive farm updates. WELCOME TO OUR STRAWBERRY PATCH! 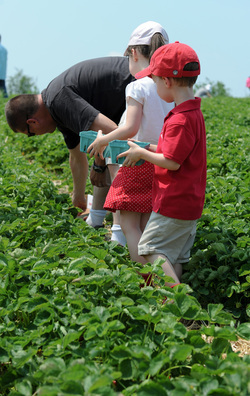 Here at Govin's we make strawberry picking a family event. We have hay rides to and from the patch and love to see the families year after year making it a tradition to come out and pick. We have both u-pick and pre-picked strawberries available. We provide containers to pick into at no charge. If you would like pre-picked berries gives us call (231-2377) and we will reserve them for you to pick up at the farm. Menomonie - the parking lot of the Cenex Convenience store next to Wal-Mart. Eau Claire - the Mega Holiday Station on N Clairemont & Folsom St.(by Menards and Culvers). If the sign does not say Govin's they are not Govin's strawberries. We only reserve berries for here at the farm, our other locations are first come. Here at Govin's, we pick into flats (about 12 lbs.) which is equal to about 2 buckets of berries. Picking into a flat lets the berries spread out and breath better. We also have pre-picked quarts of berries available. Come out and enjoy our mouthwatering summertime treats. The season is not very long, about three weeks depending on mother nature, so don't wait to long to join the fun at Govin's Meats & Berries. The old myth of berries are done by the 4th of July is not true, some years they are just getting a good start. So call the berry hotline (231-2377) and we will be more than happy to give you an update on the strawberries. If you have never been here, there is a map at the bottom of the page since all the GPS and map programs online have us at an incorrect location. When you print the map, there is also a coupon for $1.00 off a flat of strawberries so don't forget to bring it along. We started out strawberry patch in the spring of 2002 by planting 3 acres (about 20,000) plants) of strawberries. In the summer of 2002, the plants started to form blossoms. At that time you remove all the blossoms so the plants don't bare fruit. By doing this the plants conserve energy which allows them to grow stronger in their first year of life. We now have six acres of strawberries. In the fall after the ground is slightly frozen we cover the berry plants with straw to keep the plants safe from the cold. The straw that is applied in the fall is removed the following spring and used for mulch and weed control in between the rows, this also conserves the soil moisture. Now that the berry plants are uncovered they start to develop new leaves and form blossoms. This time you let the blossoms develop into strawberries. About 21 days after blossoms start, the fruit is ready for picking. At Govin's we have u-pick and pre-picked strawberries available. Here at Govin's, we pick into flats (about 12 lbs.) which is equal to about 2 buckets of berries. We also have pre-picked quarts of berries available.